What are the fibres for? The extracellular matrix contains fibres made out of protein. The fibres can vary in diameter, and in the way in which they are 'woven' into a network. For example, in tendons, the fibres run parallel to resist forces in the direction in which the muscle produces force. In bone they are arranged in alternating parallel layers. Whereas GAGs are good at resisting compressive forces, fibres are good at resisting tensile forces. There are two main types of fibre; collagen, and elastin and fibronectin. You may also come across Fibronectin which is a non-collagenous fibrous connective protein that helps cells to stick to the extracellular matrix. A diagram of a collagen molecule. Collagen is the most common fibrous protein in the ECM, and it isi important for resisting tensile forces. It is the most abundant protein in mammals - 25% of total protein mass! It is a protein composed primarily of the amino acids glycine & proline, and it also contains sugar groups. It is acidophilic and stains with eosin in H&E-stains (to look pink in sections). It is secreted by fibroblasts as procollagen, and amino acid residues at the ends of the protein are cleaved off outside the cell to form collagen, which then aggregates into fibres, etc. This prevents formation of large fibres in the cell (would not be good for the cells!). Collagen consists of three protein chains which wrap around each other in a helical arrangement. The collagen molecules are often crosslinked, for extra strength - tensile strength. About 15 kinds of collagen are known. Type I is the most common - 90% of all collagens are type I. This type is found in bone, skin, tendon, ligaments, cornea etc. Types I, II, III, V and IX are fibrillar, which means that the protein chains assemble into fibrils, 10-300nm in diameter. Types V & VI form networks in the basal lamina. Type VI helps to anchor basal lamina of skin to underlying connective tissue. Collagen fibrils have a characteristic 64nm banded appearance under the EM (see the photograph on the right), and the fibres are not branched. The reason why this 64nm banding pattern is seen, is because the collagen molecules (red arrows above) pack in a staggered arrangement into the fibres. When tissue is fixed and stained for EM, the stain only fills the gaps between molecules (B), and not regions where there are no gaps (B). This gives a stripy appearance to the fibres in the EM, as shown in the Scanning electron micrograph on the right. Now look at this image, a section of a lymph gland that has been stained with silver salts to reveal reticular fibres. Can you identify the fibres? 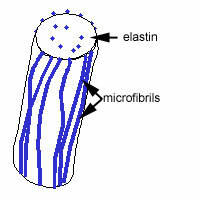 Elastin makes tissues elastic, so that the tissue will recoil after stretch. Elastic fibres are 5 times more extensible than an elastic band! Mixing up collagen (less extensible) and elastin, prevents overstretch. Elastic fibres are made up of elastin and microfibrils which are made up of a mixture of elastin and glycoproteins, including fibrillin. Elastin is made from its soluble precursor, tropoelastin. Tropoelastin is secreted from the cell, and elastin fibres are assembled close to the extracellular surface of the cell, onto a scaffold of microfibrils. The elastin fibres are very pale staining, because elastin is an amorphous protein. As well as being made into fibres, it can also be assembled into fenestrated sheets called elastic laminae. This is a picture of elastic cartilage. The cells are chondrocytes, and they are embedded in a matrix, rich with fibres, that are mostly elastic fibres. The chondrocytes appear to be surrounded by a non-staining space, that is called a lacuna. Can you identify the chondrocytes, fibres and lacunae? Diseases associated with collagen and elastin defects. Mutations are that affect type I collagen causeosteogenesis imperfecta. This gives weak bones that fracture easily. Mutations that affect type II collagen cause chondrodysplasias, in which the cartilage is abnormal and this leads to bone and joint deformities. Mutations that affect type III collagen cause Ehlers-Danlos sydrome, which leads to fragile skin, blood vesels and hypermobile joints. In Marfan's syndrome, there are mutations in the fibrillin gene, which affects tissues rich in elastic fibres, such as the wall of the aorta. This means that the aorta is more prone to rupture.